NEW ORLEANS – The Oregon women have won the inaugural NCAA Division I Terry Crawford Program of the Year Award as announced by the U.S. Track & Field and Cross Country Coaches Association on Friday. Heading into the outdoor championships Oregon was just a half point behind Florida State in the overall Terry Crawford standings. With a second place finish outdoors the Ducks earned two points giving them a final tally of 13.5 points. Florida State finished second in the standings with 15 points after finish fourth overall at the NCAA Outdoor Championships earning four points in the Terry Crawford standings. Both Oregon and Florida State finished in the top ten in all three championships this season. Oregon finished second at the NCAA Cross Country Championships and tied for ninth at the NCAA Indoor Championships. Florida State finished third at the cross country championships and eight at the indoor championships. Arizona State finished third in the team standings with 22 points, followed by Michigan with 34 points and Florida with 40.5 points. The Terry Crawford Program of the Year Award is awarded annually to the most outstanding NCAA Division I women’s cross country/track & field program. The award honors the institution that has achieved the most success in each academic year (spanning the cross country, indoor track & field, and outdoor track & field seasons) based on the institution’s finish at the NCAA Division I Championships. 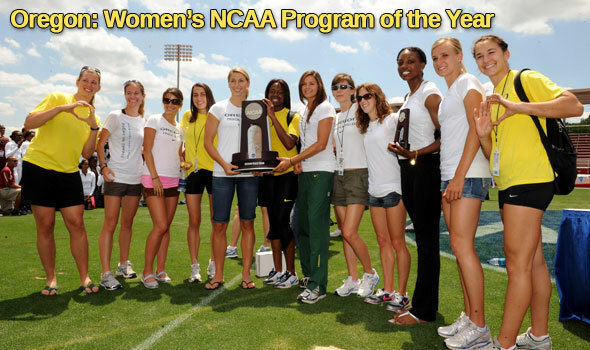 In order to be eligible for the award, teams must qualify for the NCAA Championships. Scoring is based on the team’s finish at each NCAA Division I Championship in cross country, indoor track & field, and outdoor track & field (i.e. 1st = 1 point, 2nd = 2 points, 31st = 31 points) with the lowest total score for all three championships combined determining the award recipient. The Terry Crawford Program of the Year Award is named after USTFCCCA Hall of Famer and current Cal Poly head coach Terry Crawford. Crawford has won five NCAA National Championships, and over 20 Conference Championships. Her 1986 Texas squad remains as the only NCAA women’s program to ever win the Triple Crown (cross country, indoor track and field, and outdoor track and field titles).